Electronic tablets like the iPad need protecting while you carry them everywhere with you! And it's nice to add an artistic touch to this accessory, just as you do with your jewelry and other bags. We offer here a selection from several of our designers...if you want to see coordinating items by that designer, click on the link provided in larger image/product info page. FITS THE Microsoft SURFACE tablet! Cotton fabric exterior in stylish print, padding between one side and the other. Measures 11-1/2 x 8 inches, designed to carry iPad and other electronic tablets that are thin (does not fit all netbooks). Full zip-around so you can open fully, and REVERSE to show a different fabric! One side has a zip pocket for accessories, lined in soft faux black leather. Comes with 1 inch wide black faux leather strap that adjusts for shoulder or cross-body carrying. The strap is detachable, so your e-carrier can fit inside tote or brief case. One fabric is blue with black scroll print, the other is black with white polka dots. Remember, this is REVERSIBLE, so you can have one showing on the outside, but see the other when you look inside, then switch them easily! 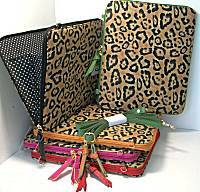 Fabulous carrier to protect your treasured electronic tablet or iPad, measures 8-1/2 x 10-1/2 inches. The size fits thin tablets, but not thicker netbooks. Full zip, dual directions, around 3 sides to it opens easily, gusseted black-and-white polkadot interior fabric. Each interior wall has fabric pocket for thin accessories/papers. Leopard printed faux leather exterior. Choice of faux leather trim color. The same trim color is found on the detachable shoulder strap, so wear this separately, or take off the strap and slip inside tote or brief case! Cotton fabric exterior in stylish print, padding between one side and the other. Measures 11-1/2 x 8 inches, designed to carry iPad and other electronic tablets that are thin (does not fit all netbooks). Full zip-around so you can open fully, and REVERSE to show a different fabric! One side has a zip pocket for accessories, lined in soft faux black leather. Comes with 1 inch wide black faux leather strap that adjusts for shoulder or cross-body carrying. The strap is detachable, so your e-carrier can fit inside tote or brief case. One fabric is bright pink flowers on black, the other is taupe, sand and black geometric. Remember, this is REVERSIBLE, so you can have one showing on the outside, but see the other when you look inside, then switch them easily!